Since I started Pilot Fire last year, I’ve written over 100 articles about how to stay focused on what’s most important in your life. Now I’d like you to give back, not just to me but to everyone who needs ideas and inspiration to face the the holiday season. Please take 5 minutes to help those of us who may come back to this article for an answer. How do you stay focused on what’s important during the holiday season? Give you a 1 in 10 chance to win a free consultation with me. I’ll do a random drawing. Plus, for one random comment out of all of them, I’ll do half a day volunteer work at the organization of your choice (no travel required). Finally, I’ll write an article featuring the idea I personally find most helpful, inspiring, and unusual. The first five commenters double their odds. There’s an improv hint I’d like to pass on to you. Don’t try to be clever. Offer what’s most obvious. It’s usually the right thing to do. Here it is again: How do you stay focused on what’s most important during the holidays? Let us know in the comments below. Image rights ignored. 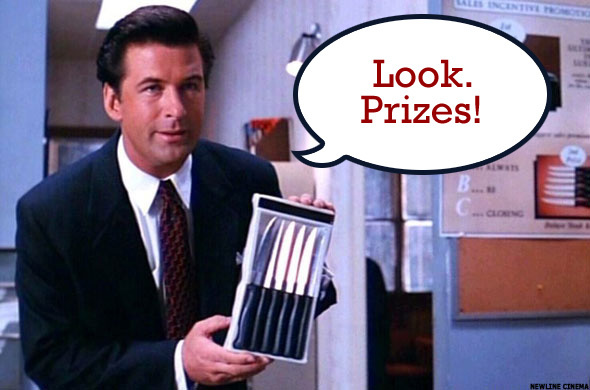 Pay to see Glengary Glen Ross and make it up for me, will ya?